I am running to share ideas for making the State of California better. I hope to pursue actionable legislation with as many groups as possible to move California forward. This is the primary reason I decided not to be affiliated with any political party. As your 15th State Assembly Representative, I will work hard on the behalf of as many residence as possible. I am a 30-year East Bay resident and 50-year California resident who will use my local knowledge to make decisions that are good for both the region and state. My platform is to bring greater transparency and accountability to our citizenry along with innovative thinking in solving problems. The East Bay is a politically engaged place known for academic achievement, scientific research, free speech, delectable cuisine, and the imaginative arts. Over the years the area has built a reputation considerably larger than a population would warrant. This however has meant that not all our voices have been heard, something I hope to amend. Oakland, Richmond, Berkeley, Albany, Emeryville, Piedmont, El Cerrito, Hercules, Pinole, and San Pablo are great places to live, but there are many items we still can improve upon including reducing crime and enhancing education. Our eco-friendly environment -- with tree lined streets, walking trails, and bike paths, often adorned with craftsman, brown shingle, and Victorians, with the occasional apartment complex nestled within - is still not an optimal community without viable means of transportation. Our downtowns are evolving, often with trendy new architecture and functional urban plans that will hopefully integrate access to shops, cafes, cultural facilities and parks. The question going forward is how will our diverse cities, with many varying needs, be brought together to meet the challenges ahead. I strongly believe that our cities should budget resources where funds will do the greatest good for the community. As your representitive, I hope to use analytics and common sense to address many of our communities pressing needs and I hope to use our valuable resources wisely to where they can do the greatest good. To help bring economic prosperity to the area I hope leverage our computational resources in area (MSRI, Simon's Center, AMPLab, etc.) to compete with "Silicon Valley" with our own "Data Mountain". Let's work to keep jobs here as well as making our communities great places to live. Objectives: To create initiatives that will help the State of California that I will share with others including my opponents and I hope to run a positive campaign on how we all can work together in building a better, productive community where innovative thinking can prosper. This is the easy one for me. I am really fortunate to have grow-up in the Bay Area where I watched/participated/advised friends build successful businesses (including some of the world largest companies). I teach entrepreneurship at UC Berkeley, it gives me great pleasure to see my students, fellow faculty and locals starting successful enterprises. My primary research is focused on “Big Data” solving large-scale problems such as climate change. I envision Data Mt. emerging in our district to compete with Silicon Valley, along with expanding the host of other innovative firms we have here, including opportunities in the shared economy. I have started several businesses in the East Bay. I am also involved in the Berkeley Startup Cluster a joint project between the community, UC Berkeley and LBNL. Here we help nurture new companies and encourage them to stay in the area, providing economic opportunities for the community. I believe by providing a hospitable place to work and live - along with a highly trained work force - we can retain and attract companies to the area. I also have strong connections to the academic world including several top economists. Three colleagues are former presidential economic advisors who agreed to make themselves available for consultation. We as a society should look to those who can make the best decisions not based on individual preference but what is best for society. We need people in government that have a diverse knowledge in: science, engineering, technology, operations, budgets, economics, education, history, social sciences and other fields not just lawyers and political scientists. I believe I can bring healthy insights in helping solve many of the states complex problems with scientific understanding and engineering methodologies. I am a public school teacher after all, UC Berkeley is a public school. I love teaching and education – some may say too much, having almost as many degrees as my 7 competitors combined. However education is not wisdom and wisdom is the real factor we should look for in our legislators. Education can expand your opportunities, but it is what you do with that knowledge that is important. It was Abraham Lincoln who helped empower people to reach their full potential through the creation of Land Grant Universities. He also helped create the Academy of Sciences and he was the only president to hold a patent. I believe we need to build on that foundation to expanded opportunities to future generations. We need to think about effective methods in education. Education that should be available to all at all different levels. Enhancing online education is one potential supplement as well as providing comprehensive goal oriented learning I would like to expand. One of the best ways to help sustain the environment is to reduce the need for energy through efficiently and reuse of materials. There are many ways to do it, for brevity I will only focus on a few: water management, rail usage and infrastructure technology. Water management – currently California uses over 20% of its energy for managing water - mostly to move and heating it. If more of it was collected locally and processed through means of local reuse it would save energy. One of the immediate action items where California could lead is to deploy a series of low-cost sensors capable for detecting/preventing water leaks and measuring water quality. California is the birthplace of commercial solar hot water dating back to the 1880’s. At one time many communities embraced solar hot water, let us create a culture and technologies were it is cool to use sun again. Effective use of railways and ports – our district is blessed to have two major ports. Let us use them to their greatest effectiveness. Instead of off-loading ship cargo to trucks that then carry them to redistribution centers, hubs could be created at the port that load preconfigured shipping containers on to railcars. This would reduce truck congestion on our roads as well reduce air pollution. As for high-speed rail I believe we should start where there is the highest need and chance of success Sacramento – Oakland – San Jose. We could jeopardize our state’s alternate transportation future with a not well thought-out failed high-speed project. I took Amtrak to work from Berkeley to Sunnyvale; it was a great deal more productive and scenic than driving. Grid management and infrastructure – in the coming years it is critical that California has a comprehensive plan to manage the “Power Grid”. As more diverse energy sources are integrated into our Power Grid and demand increases (primarily electric cars), we will need a power/information infrastructure to handle demand. I am glad to report that several colleagues - including those at UC Berkeley - are looking into how to solve these problems. It is one of the many solutions we are looking at in in Big Data. I have touched on a few ideas that I think are important, if you have others issues you want to address please fell free to send me an email at Berkeley@gmail.com. "Lawsuit Claims ... 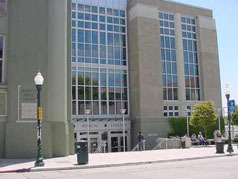 Your Neighborhood"
"Mapping the World ... One Neighborhood at a Time "
The Berkeley Public Main Library is one of Downtown';s Treasures. It is a gift from past visionaries that we must maintain to pass down to future generations. 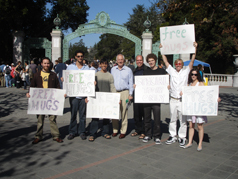 Mayor Tom Bates and Bernt Wahl posing with students on Sproul Plaza. 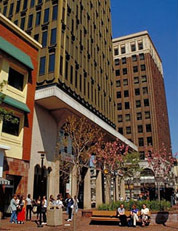 U. C. Berkeley academic programs often rank among the top in national. In the future, if elected councilperson, I plan to use City of Berkeley's tremendous talent base to make our community better. N. Cal. Solar Energy Assn.